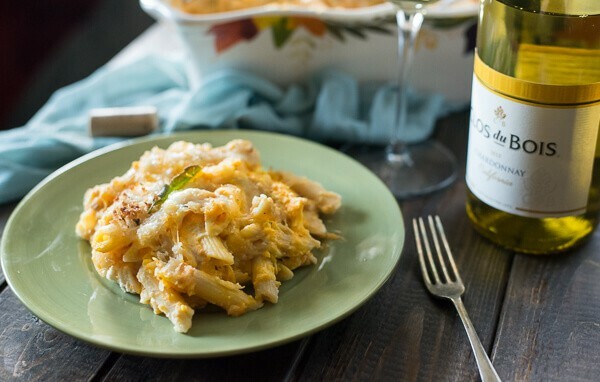 A tasty seasonal spin on an easy Italian dish, this Five Cheese Butternut Squash Baked Ziti makes a great meal between holidays or a sensational side to the main event! Can we talk about cheese? Let’s talk about cheese. 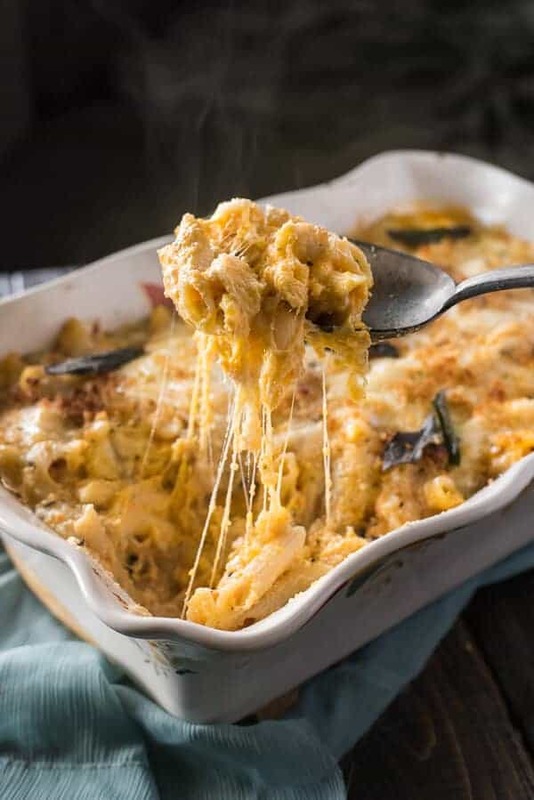 Actually, let’s just stare at that cheese pull up there and get really hungry together, instead. It’s November. It’s Tuesday. 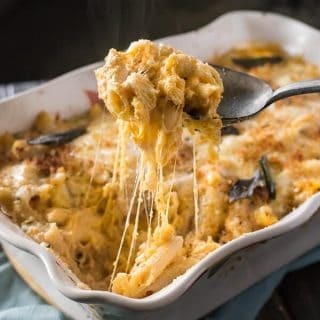 It’s time for comfort food in the form of the cheesiest, creamiest, crunchiest, sagey-ist, starchiest, squashiest darn recipe I’ve ever attempted. You’re welcome in advance, bee-tee-dubs! So all year long, most people try to eat in moderation, right? Work out, stay healthy. I know I make vain attempts to in my own way, but being a wannabe full-time blogger has its downfalls, and the unfortunate job of having to taste test every. single. thing. that comes out of my kitchen until it’s just right? That’s one of them. Some would look at that as a win, of course, and that’s fine, too. My point being after spending all year trying to eat light and seasonally, when fall rolls around, all of that just goes out the window. All you really want when the weather turns chilly is that down-home comfort food that mama used to make. Or something that at least reminds you of where you came from. Simple, great tasting food that you know and trust. Obviously, a big pan of yummy Italian pasta fits the bill, especially when it’s made with Barilla Penne Pasta, the #1 choice of Italy. 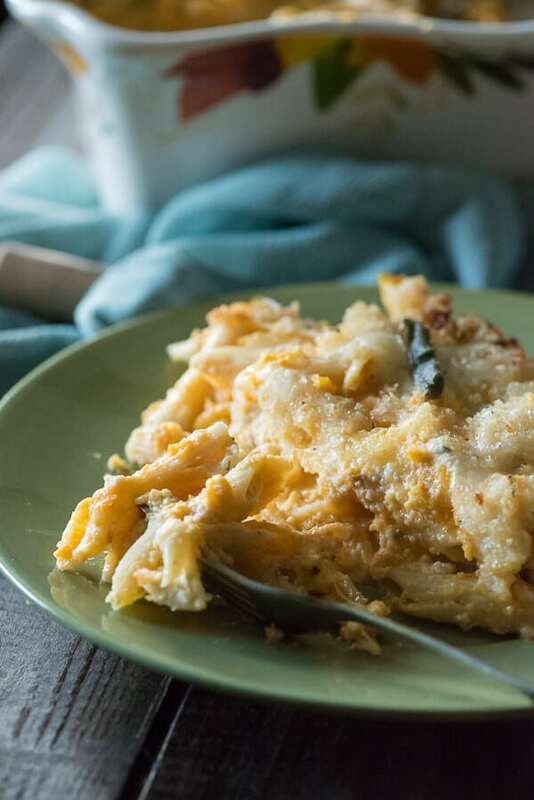 Believe me when I tell you this Five Cheese Butternut Squash Baked Ziti needs a wholesome, hearty pasta to hold up to the incredibly cheesy sauce this recipe throws at it. Gruyère. Fontina. Ricotta. White Cheddar. Parmesan. Bam, 5 cheeses to fall in love with, all put together with the butternut squash purée of your dreams. But you know, this meal (or side dish!) still needs something. A bright, refreshing oak varietal, perhaps. Yep. Because not only do you want hearty food after a long summer of being bikini-ready, you also want all the wine. 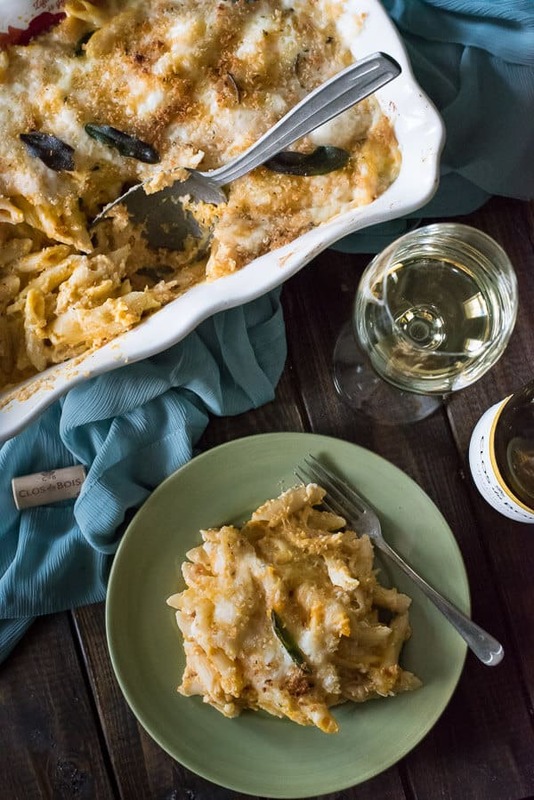 You may know that I am a Cabernet girl at heart, but I also know how to enjoy a nice white, and Clos du Bois Chardonnay was just about the nicest pair for this recipe that I could have chosen. Well-balanced, full of the fall flavors you’ve been missing, and terribly easy to enjoy. A real joie de vivre kinda glass. 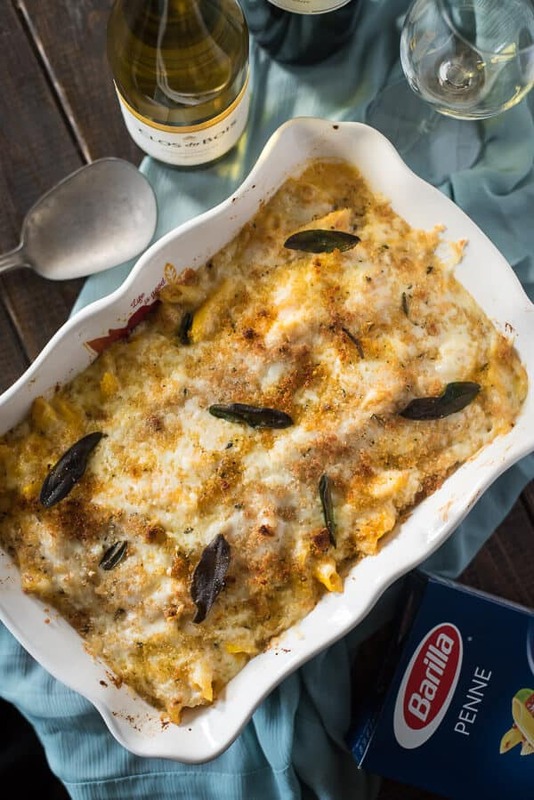 Of course, Clos du Bois pairs nicely with any holiday entertaining – especially with pasta dishes, which is why I chose to pair it with this recipe. Keep that in mind next time you’re out spirit shopping, yeah? And don’t forget to holla back at me when you see how affordable their French-inspired Cali wines are! As for me, my pantry and wine fridge are now appropriately stocked for the rest of cold, comfort food season. Why mess with a match made in heaven? Poke holes with a fork in the skin of the butternut squash halves, Place squash, garlic cloves, and shallots on a foil-lined baking sheet. Roast about 25 minutes, until the shallots and garlic are lightly golden brown and tender. Remove them, and continue to roast the squash another 20-30 minutes until it is fork tender. After it's baked, allow to cool 10 minutes before attempting to handle. Remove seeds and guts of squash, then spoon roasted squash, shallots, and garlic into food processor and puree until mostly smooth. Set aside. While squash is roasting, melt butter over medium heat in a small saucepan. Cook, swirling the pan occasionally, and watching for it to turn a golden brown color and begin to release a nutty smell. Add breadcrumbs to butter over the breadcrumbs and stir with a fork, then set aside. Combine ricotta, egg, sage, salt and pepper in a small bowl and stir until well combined. Refrigerate until ready to assemble. Place the butter in a skillet over medium heat. Once melted and hot, add in the sage leaves and cook for 1-2 minutes, flipping halfway through. Remove and drain them on a paper towel. Preheat oven to 375 degrees F. Spray a 9x13 casserole dish with cooking spray and set aside. Bring a large saucepan of water to a boil. Salt the water, then add the pasta and cook, stirring occasionally, until al dente. Drain and rinse pasta and transfer to a large bowl. Melt butter in a medium saucepan over medium-high heat. Add the flour and whisk, stirring well, and cook about 1 minute until slightly browned. Whisk in the milk, cream, nutmeg and salt and pepper. Simmer for about 5 minutes, whisking often to prevent scorching, until mixture begins to bubble up. Remove from the heat and whisk in the Gruyère and white cheddar, stirring until smooth. Add the pureed butternut squash and stir until well combined. Reserve 1¾ cup sauce in a measuring cup, then pour remaining sauce into the pasta bowl and toss to combine. Spread 1 cup sauce in the bottom of the prepared casserole dish. Pour in ½ of the pasta. Spread ricotta mixture on top. Add remaining pasta and the rest of the cheese sauce. 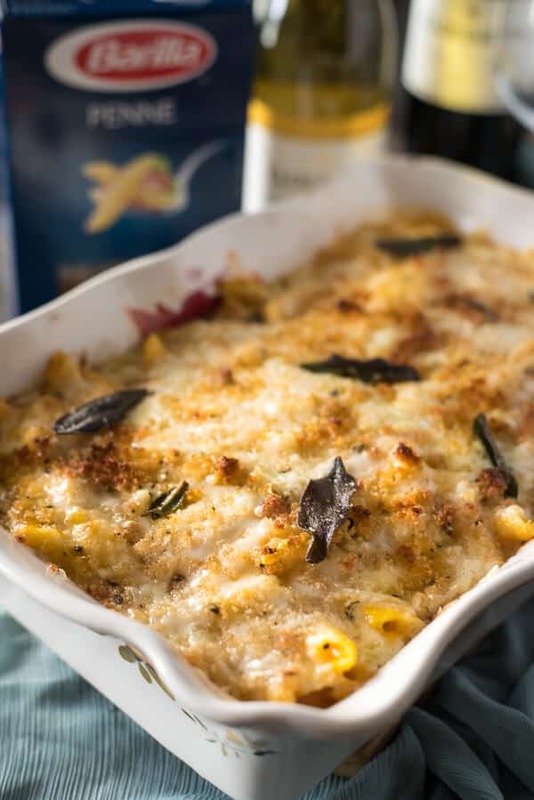 Sprinkle top with shredded Fontina and Parmesan, brown butter breadcrumbs, and fried sage leaves. Tent with foil and bake 15-25 minutes, until the cheese is melted. Remove foil and broil on high for 4 minutes. Let stand about 5 minutes before serving. Enjoy! Find Barilla Penne Pasta & Clos du Bois Chardonnay and Cabernet Sauvignon at your favorite local retailer! For even more recipe inspiration, visit Barilla.com. This looks like an amazing recipe! I love that fall means all the squash recipes come back 🙂 I am going to have to give this a try!